New York – September 28, 2012 – AMC announced today the greenlight of a new unscripted original series “Road Show” working title (w/t), created and executive produced by Laurie Girion (“Cheerleader Nation,” “Welcome to Sweetie Pies”) and Storyvision Entertainment and distributed internationally by Sony Pictures Television. “Road Show” (wt) organizes competitions in small towns across the country, featuring local talent who get the chance of a lifetime to be in the spotlight. AMC also announced today the renewal for a second season of “Small Town Security,” the unscripted series that centers on a small, family-run security and private investigation company. Season one premiered in July to critical acclaim, with USA Today hailing it as a reality show that “manages to defy the stereotype” and the Associated Press saying it “bristles with authenticity even as it feels deliriously (and sometimes hilariously) hyper-real with its larger-than-life characters.” The series is produced by Left/Right Films. “Small Town Security” and “Road Show” (wt) are both scheduled to premiere in the second quarter of 2013. “Road Show” gets into the heart of America’s obsession with performing and becoming a star under the notion that every town has a story and every town has a star. The series centers on small town talent shows, and the comedy that ensues when a little bit of Hollywood shows up to give people who have long submerged their artistic dreams of becoming a star a chance to be the big fish in the little pond of their hometown. Each episode the series holds “open call auditions,” welcoming everyone from singers and dancers to comedy acts and jugglers. “Road Show’s” director and choreographer, who are the series’ two mentors, then select four finalists to participate in a talent show held at a local venue. The audience gets to know the finalists and their back-stories as they are coached over multiple days by these mentors. The goal is to bring out the best of their abilities in preparing them for their performance at a “Big Show” in front of a local audience who will select the winner. “Road Show” has been greenlit for 8, one-hour episodes. 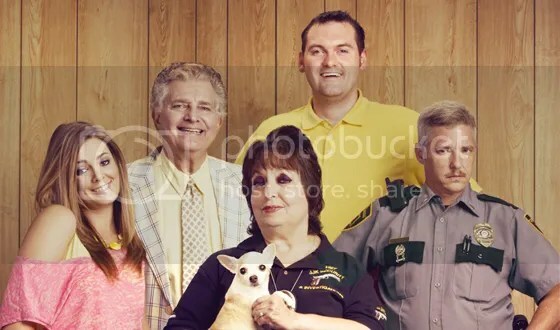 “Small Town Security” first premiered on AMC in July 2012. The series is executive produced by Ken Druckerman and Banks Tarver from Left/Right Films (This American Life, Boomtown, Mob Wives). “Small Town Security” is an unscripted, workplace series. This sometimes hilarious, sometimes poignant, and sometimes just plain unusual series explores the inner workings of a small, family-run security and private investigation company in Ringgold, Georgia called JJK Security. The show captures the day-to-day running of the business, but it’s really about the curiously entertaining and oddly compelling characters that inhabit this world. From sophomoric humor to soap opera-like drama, the incredibly genuine and slightly bizarre employees at JJK are definitive proof that truth can be stranger than fiction. Season two has been renewed for eight half-hour episodes. AMC’s Stillerman, Mary Conlon, VP of non-scripted original programming, Jason Fisher, SVP of production, Tony Colon, VP of production and Ari Mark, director of development, oversee the development and production for the network’s unscripted series. AMC reigns as the only cable network in history to ever win the Emmy®Award for Outstanding Drama Series four years in a row. Whether commemorating favorite films from every genre and decade or creating acclaimed original programming, the AMC experience is an uncompromising celebration of great stories. AMC’s original stories include “Mad Men,” “Breaking Bad,” “The Walking Dead” and “Hell on Wheels.” AMC further demonstrates its commitment to the art of storytelling with its slate of unscripted original series, as well as curated movie franchises like AMC’s Can’t Get Enough and AMC’s Crazy About. AMC is owned and operated by AMC Networks Inc. and its sister networks include IFC, Sundance Channel and WE tv. AMC is available across all platforms, including on-air, online, on demand and mobile. AMC: Story Matters HereSM. This entry was posted in TV NEWS and tagged amc network, renewed, road show, season two, small town security, television, unscripted. Bookmark the permalink.